Starting this fall, T. Nicole Images will be popping up at a location near you! Fall offers an abundance of beautifully colored foliage, perfect for outdoor photography to commemorate a new season. So, grab your family, your friends, your pets or just yourself and join me in celebrating the fall season with a mini photoshoot at a portrait pop-up location. Pop-up locations and dates will be announced and updated here on the website, Instagram, and Facebook, so be on the lookout and book your appointment in advance by emailing me. 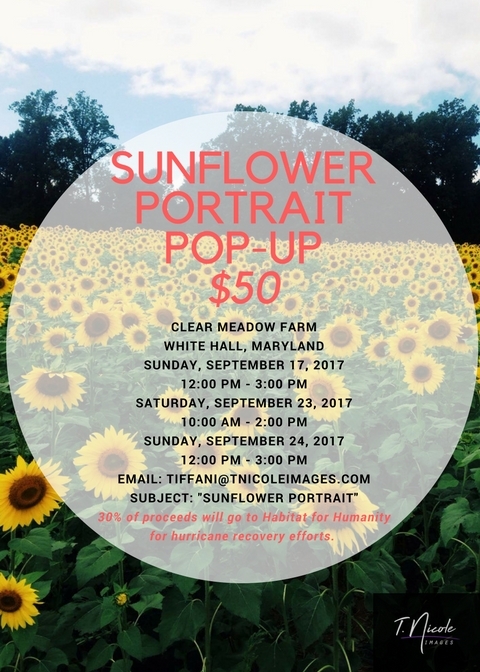 *You must book your appointment in advance by emailing me with the subject line "Sunflower Portrait."